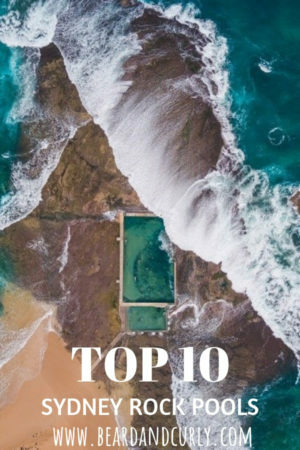 After a serious session of location stalking on Instagram, I was intrigued when I saw an aerial photo of a pool embedded into rock and surrounded by waves. 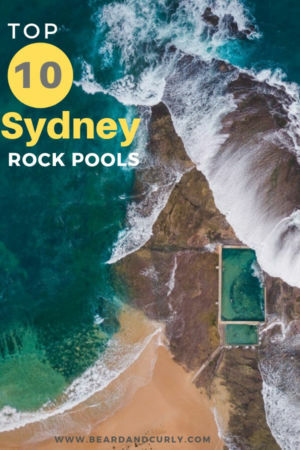 After further investigation, I found out the name was the Mona Vale rock pool in Sydney, Australia. 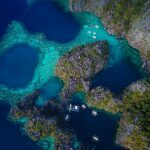 Ever since buying a drone in late 2016, I had plans to one day capture this amazing pool. Little did I know that there are dozens of these man-made ocean pools. Each town seems to have their own. 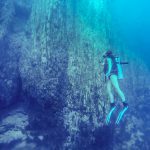 Distinct features from concrete barriers, swimming lanes, and rock boulders all create a different effect. 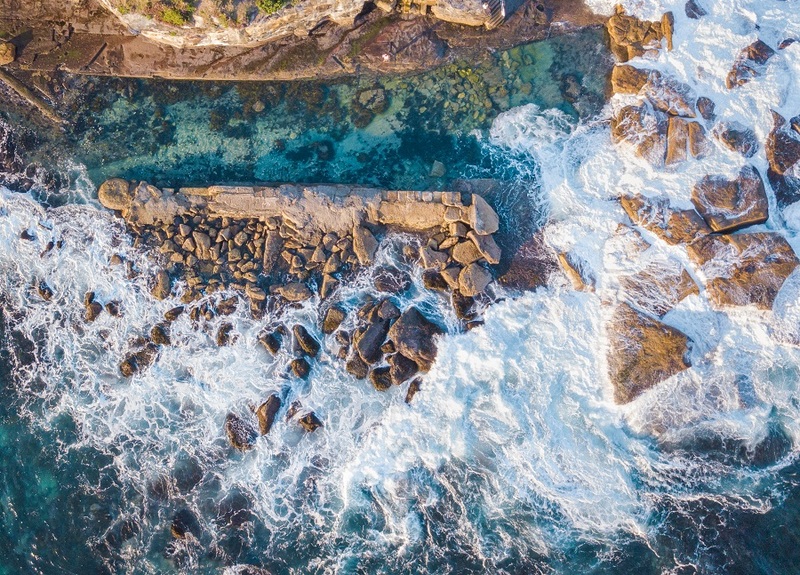 We spent two days exploring the Sydney rock pools with our drone. We allocated one day for North Sydney, and another for South Sydney. These were are our favorites. Wylie’s Baths dates back to 1907 and is one of Sydney’s oldest rock pools. This is not a free rock pool, but admission is only $5.50 for adults, $2.60 for children, or $15 for a family. 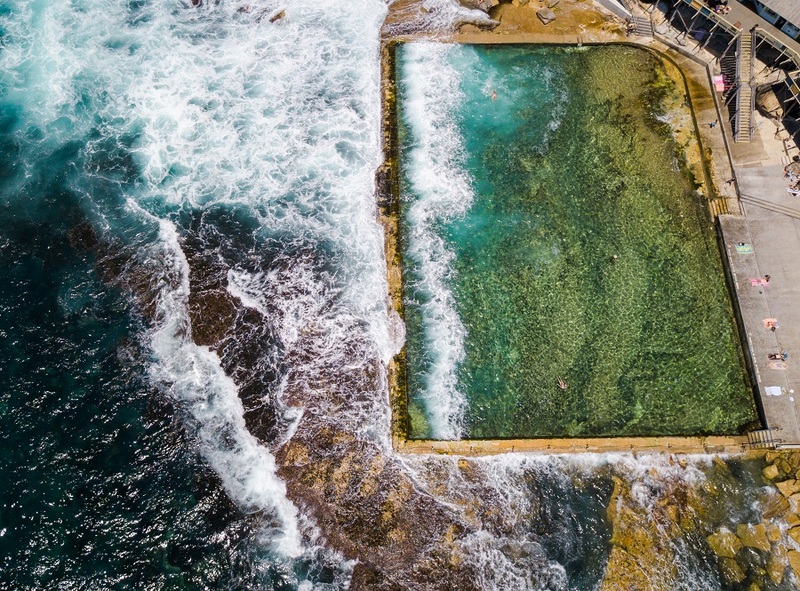 The rock pool is located in South Sydney, just south of Coogee Beach. There is public parking on Beach Street or Neptune Street. Coogee is accessible by bus from the downtown area on buses 373, 377, or M50 taking roughly 30 – 40 minutes. 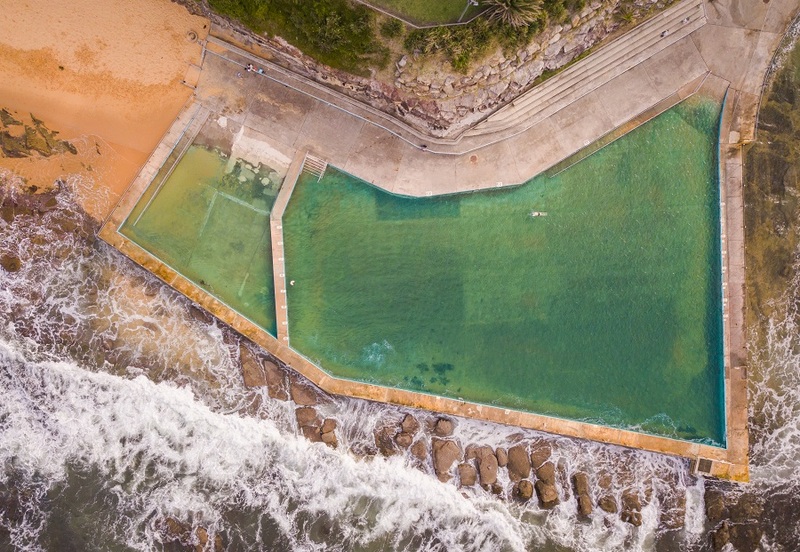 Located beside Wylie’s is McIver Baths, Syndey’s last remaining women’s-only rock pool. The Collaroy rock pool has recently been upgraded and is excellent for kids as well as people needing disability access. The modern shape of the pool is one of my favorites. 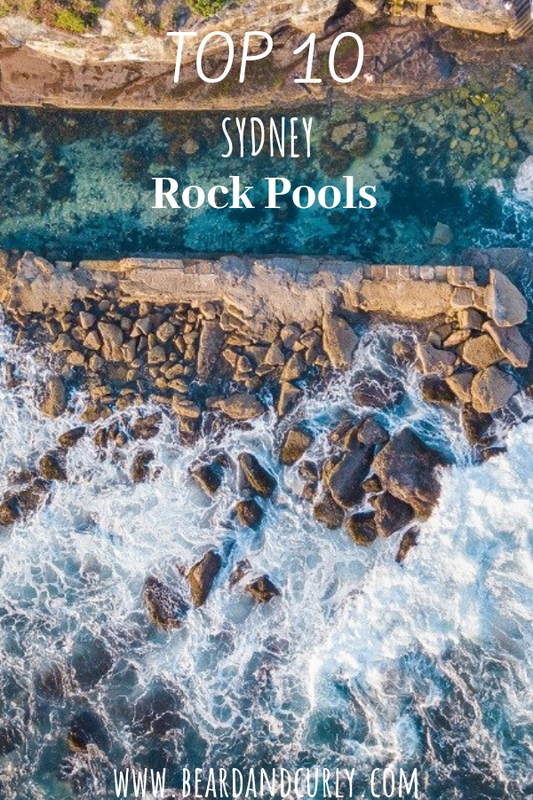 The rock pool is located in North Sydney on the south end of Collaroy Beach. Public parking is available on Beach Street. Collaroy is accessible by public transport. From the downtown area, take the E83 bus which will take 1 hour. From Manly, take bus 199, approximately a 40 minute ride. 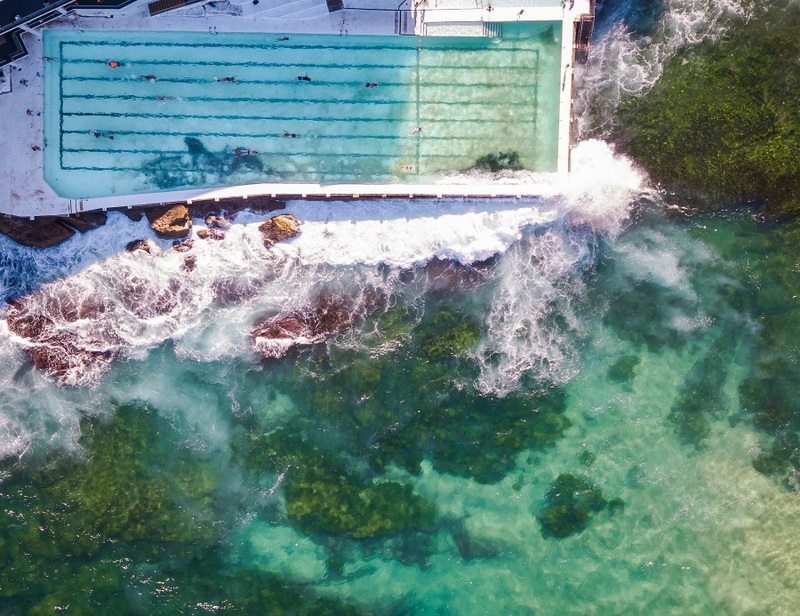 Bondi Beaches’ iconic landmark swimming pool is over 100 years old and a favorite amongst locals. The pool is open year-round to the public featuring a large lap pool and a smaller kid’s pool. The pool has lifeguards during opening hours. 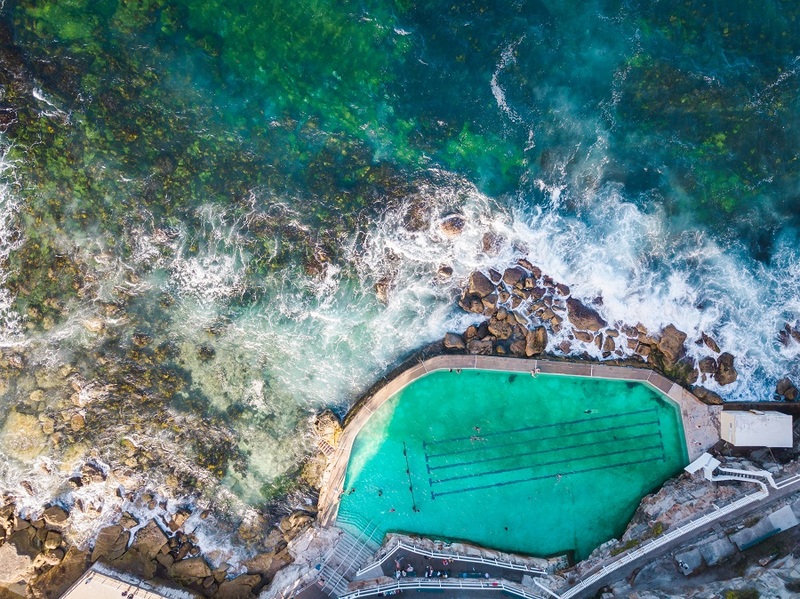 Bondi Icebergs Pool is known for their strong membership program, which is required if you live within a 5km radius (postcodes: 2022, 2024, and 2026). If you live outside of the 5km radius, you can sign in as a guest visitor for the day. Entry costs $7 for adults, $5 for children, or $20 for a family pass. Entry includes access to their sauna. The pool is closed on Thursdays for cleaning. Bondi Beach is a popular tourist beach town located in South Sydney. It is accessible from downtown via public transportation on the 333 or 380 bus routes, which take around 40 minutes. 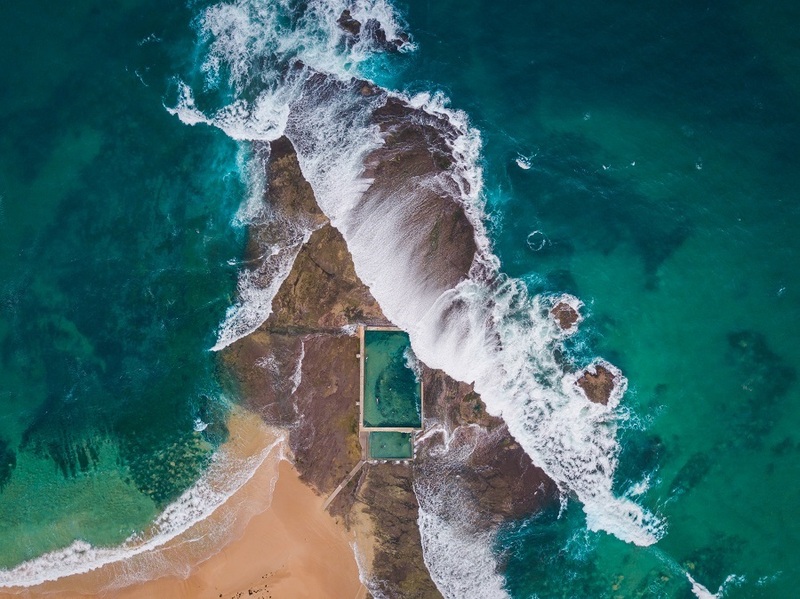 The North Narrabeen rock pool is a North Sydney icon for rock pool swimmers. Located north of the surfing hotspot Narrabeen beach, parking is pay and display off of Ocean Street. There is a wooden boardwalk separating the main 50-meter lap pool from the rest of the pool. Narrabeen is accessible by public transport from downtown on buses E85, E88, E89 or B1 towards Mona Vale. It takes one hour. From Manly, take bus 199 which takes one hour. Access to the pool is free. Curl Curl Beach in North Sydney is one of Sydney’s best surfing beaches. Curl Curl is home to not one, but two rock pools. While visiting, I would also suggest a visit to the north side of the beach where there are walking trails up to coastal cliffs called Cole’s Ledge. 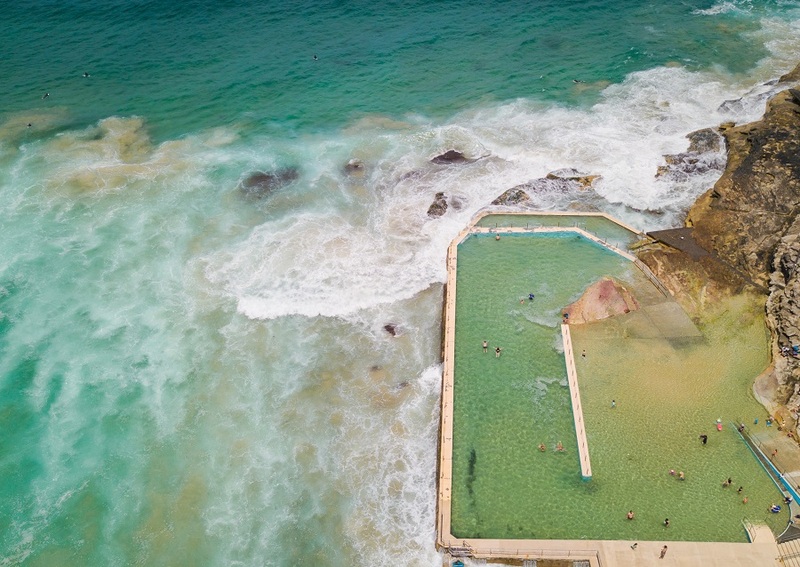 The South Curl Curl rock pool is right beside the ocean swells, making this a favorite for those who enjoy the waves crashing into the pool as you swim. Curl Curl Beach is accessible by public transport. From Manly take bus 136 (20 minutes) or from downtown, take the M30 to bus E65. You also can take the ferry from Circular Quay and then the bus from Manly, which will take one hour. One of my personal favorite rock pools, not just for its aerial view, but to spend the day on the South Sydney coastline. This rock pool is free to the public with basic restrooms and changing facilities. During high tide, the swell can ferociously send waves into the pool. 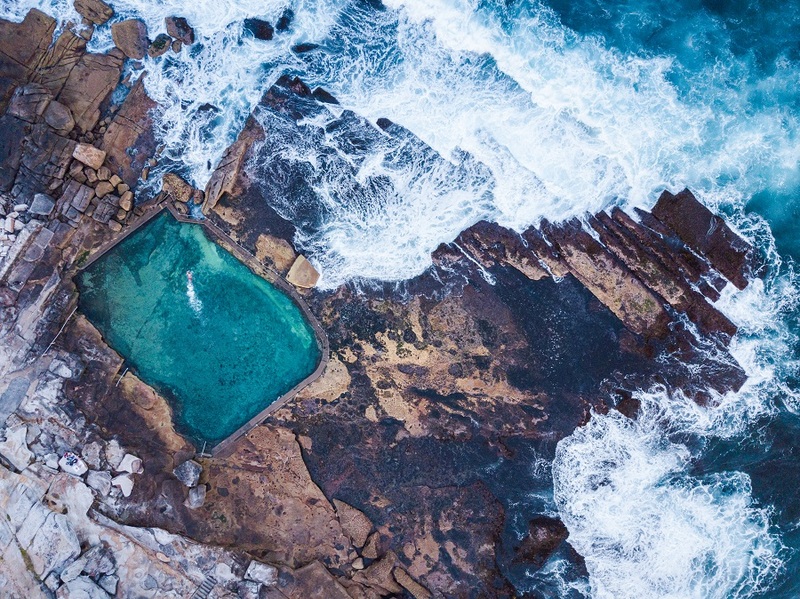 This is one of the most natural-feeling rock pools in Sydney. Mahon Pool is accessible by public transport from downtown via bus 373 and 377, a 30 to 40-minute journey. 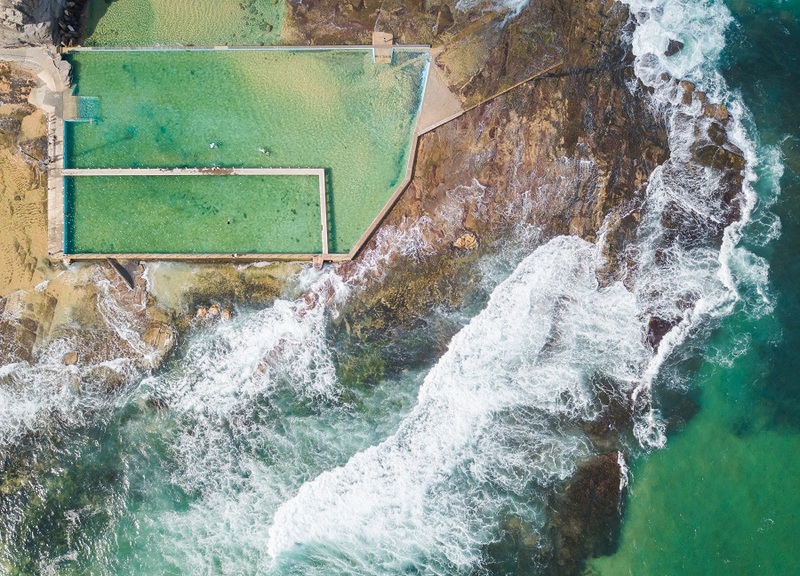 Bronte Baths is a beautiful pool located at the south end of Bronte Beach. 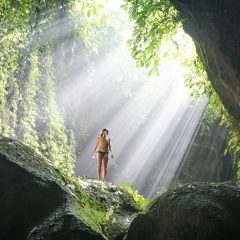 Located on the cliff above the ocean, the views from here are stunning. There are a few designated swimming lap lanes that are 30 meters, so it is not the best for advanced swimmers looking for a lengthy swim, but great for a quick swim or wanting to enjoy the Bronte views. Access to the pool is free for the public. Bronte is located in South Sydney and is along the famous Bondi to Bronte coastal walk. Bronte Beach is accessible by public transport from downtown via bus 333 and 379. There is some parking available on Bronte Road. Giles Baths is located in Coogee, the adorable and trendy beach town in South Syndey. The most natural of all the rock pools I visited, waves are constantly crashing into the pool. This rock pool is not the best for swimmers wanting to take laps. It is better suited for a leisurely swim and having some fun in the ocean. The baths are located on the far north end of Coogee Beach and are accessible from the trail at Dolphin Point. Access to the pool is free for the public. Public transport is available from downtown via bus X73 and M50, which takes 30 minutes. As mentioned above, Curl Curl beach is home to two rock pools. North Curl Curl rock pool takes the cake as the more beautiful rock pool. This stunner has a massive rock in the middle of the pool and due to its location, massive waves crash into the rocky shore. Access to the pool is free for the public. And the winner goes to…Mona Vale rock pool! 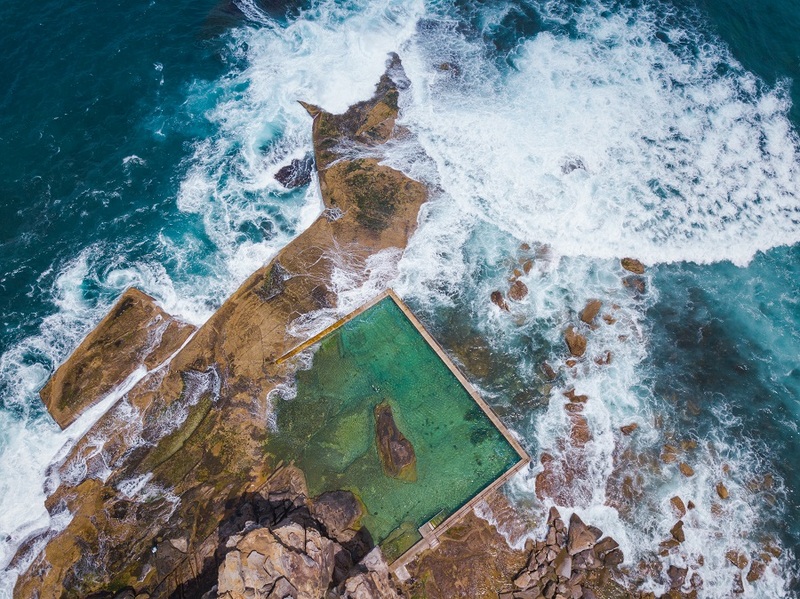 The perfect placement of this rock pool in North Sydney has waves crashing into both sides of the pool. 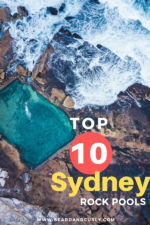 From above, this is one of the best aerial landscapes in all of Australia. Mona Vale is pretty far out there, but it is accessible by bus. From downtown, bus E88 heads up the coast and passes through Mona Vale. It takes around one and a half hours. From Manly, buses B1 and 199 both take around one hour. Access to the pool is free for the public.